Attendance Works and the Everyone Graduates Center, September 2017. 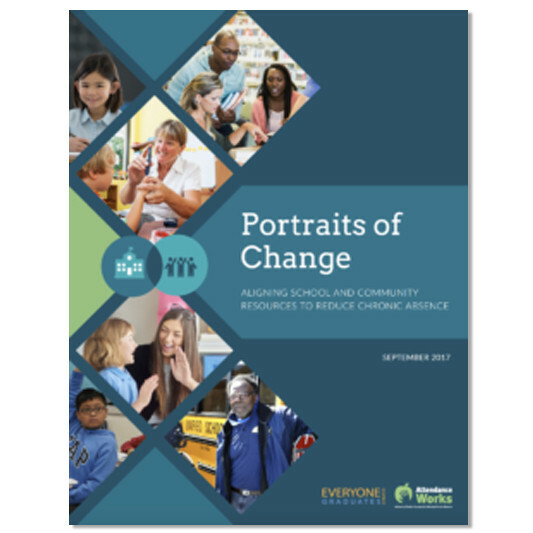 This report, Portraits of Change: Aligning School and Community Resources to Reduce Chronic Absence, provides a national and state analysis of how many schools face high levels of chronic absence and discusses the implications for state and local action. The report relies on the most recent federal chronic absence data for the 2013-14 school year. It includes examples of attendance initiatives from communities across the U.S. that show how chronic absence can be turned around, even when it reaches high levels in a school or district or among a particular student population. It also shares how partners such as businesses, nonprofits and local governments can team up with educators and add support and resources. Download messaging materials, and a social media image, to spread the word about Portraits of Change. To best understand how many and which schools are most affected by chronic absence, data must be examined at the state and local levels. Gaining a deeper understanding of the size and scale of the problem is critical to determining how best to align resources in order to prevent and address chronic absence. Click on your state below to download an analysis of school level chronic absence.